This is a surprisingly mild pâté without a detectable “lamby” taste. You’re probably not going to win any converts to non-pâté enthusiasts, but those who enjoy pâté will love it! Heat a skillet on the stove top on medium heat and add the butter. Once the butter is melted and bubbling, add bacon and fry for three to five minutes until just cooked, but not too brown. Add the onion and garlic continue to fry until the onion goes translucent. Add the lamb’s liver slices and cook brown on either side (if your skillet isn’t large enough, you may have to transfer the onion, garlic and bacon to a separate bowl while you cook the liver. Once the liver is browned, add bacon mixture back in). Add the tomato paste and stir until incorporated. Add a splash of balsamic (about a teaspoon) and sprinkle in thyme and tarragon. Stir and remove from the heat. Leave the liver to go cool, add the coconut milk. Taste a small piece of the liver and add salt if necessary. Once cooled a little, transfer the mixture to a food processor or blender. Blend well until smooth. Taste and add more salt if needed. Spoon the mixture into a small serving dish. 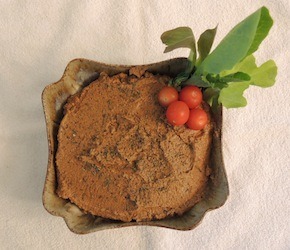 Smooth the pâté with a rubber spatula and sprinkle the top with a little thyme or garnish as desired. To keep the top from drying out, you can pour over some melted butter forming a thin layer or wrap with plastic wrap so the wrap is in contact with the top of the pâté. Allow to cool in the fridge for 2 hours or so before serving. This will make a textured pâté that is quite nice, but you prefer an extra smooth pâté, push through a sieve with a spatula before transferring to the serving dish. Serve with sliced vegetables, use as a spread or just eat it with a spoon! Read Doug’s blog post about the health benefits of organ meat!